Tax season is already tense enough, but add to that the frustration of misplacing or never receiving your Form W-2, and tax time becomes downright overwhelming. However, if you don’t have your W-2, Wage and Tax Statement, when you need to file your tax return, don’t fret. 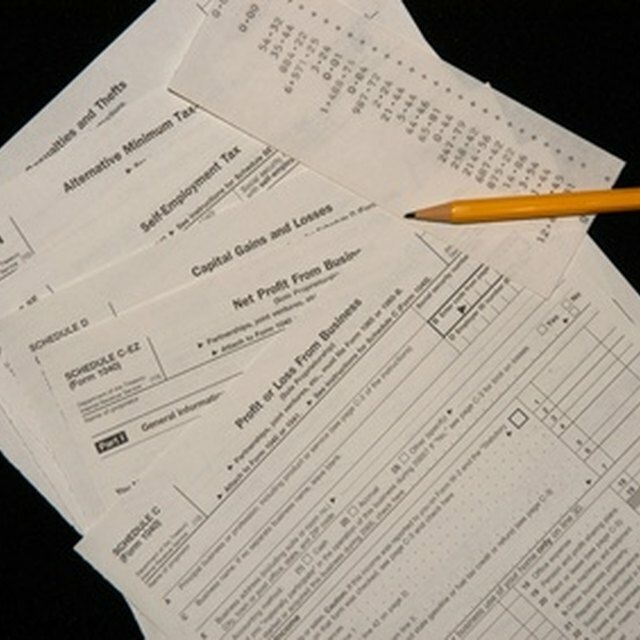 You can use your last pay stub to estimate your tax return. Armed with your last pay stub of the year, you should have all the information you need to complete your IRS Form 1040, U.S. Individual Income Tax Return, so you can calculate the amount of taxes due. What Information Do I Need From My Paycheck Stub? Your last pay stub of the year should have your year-to-date (YTD) wages; state, local and federal income taxes withheld; and your share of FICA taxes, including Medicare and Social Security. If you only want to have an early estimate of your taxes owed or possible refund before receiving your W-2 from your employer, check a helpful online tax refund calculator using the pay stub to give you a pretty accurate estimate of your tax obligation. All you need to do is take the information from your last pay stub and, using an older W-2 or a blank W-2 example online, enter your current figures in the appropriate boxes. Next, simply plug in the figures taken directly from your final YTD paycheck, such as your YTD gross income, your YTD deductions and so forth, into an online calculator, tax software or onto a paper Form 1040 to give you an idea of what you’ll owe. However, if you need to use a paycheck stub to calculate the amount of actual taxes you owe because you did not receive a W-2 from your employer, there are a few things you need to take into consideration before filing your tax return. How Do I File Taxes if I Don’t Receive a W-2? While you can use your last pay stub to get an idea of your tax obligation for the year, it's a different story when you do not receive a W-2 from your employer. Employers are required to give their employees a W-2 by January 31. If you don’t receive it by the second week of February, contact the IRS so they can notify your employer of the missing W-2 and send you a Form 4852, Substitute for Form W-2, Wage and Tax Statement, or Form 1099-R, Distributions From Pensions, Annuities, Retirement or Profit-Sharing Plans, IRAs, Insurance Contracts, etc. Also notify your employer that you haven’t received your W-2 and check to make sure your current information is on file. Sometimes, delayed W-2s are the result of errors like misspelled names or addresses. If you don’t receive your W-2 in a timely manner, you will have to use your last pay stub and Form 4852 to file your return. You will receive Form 4852 when you get a copy of the IRS’ notification to your employer. It is a straightforward, one-page form that in essence walks you through recreating your W-2. Fill out the form according to the instructions found at the bottom. After you have entered the various YTD totals in the appropriate boxes, sign the form and attach it to your Form 1040. Mail both forms to the IRS. Note that you will not be able to e-file your tax return if you need to attach a Form 4852. The IRS knows that taxpayers make mistakes. If you find that you reported something incorrectly, file IRS Form 1040X, Amended U.S. Individual Income Tax Return, as soon as you notice the error. You do not need to file an amended return just because you did not receive your W-2 in time and so had to file the return with a Form 4852. But if you forgot to attach a supporting tax information document, the IRS will request these from you. You also shouldn’t file an amended return to correct any mathematical errors. The IRS will correct these errors. However, if you notice errors that can affect tax calculations, like using the wrong filing status or claiming the wrong number of dependents, then you'll need to file an amended return.